The next Parents' Forum will be on Tuesday 13 March at 6:00pm. Please see ParentMail for more details. Congratulations this month go to...numbers 7, 12 and 82. The winners will be sent a cheque of £60, £40 and £20 respectively for this month's draw. Thanks to all parents who have supported the school in this way and to our new Head Girl (Milly) and Head Boy (Will) for drawing the numbers. On Tuesday evening the Parents' Forum were consulted on alternative assessment reporting models. I am sure that all who attended would like to thank Alan Davies for sharing his research with us. It is fair to say that the task of deciding on a model for St Ivo school is a huge undertaking...especially in light of the recent (and imminent) changes to national examination and grading systems. On a lighter note......Don't forget to sign up for the SISA 200 Club. Tickets are only available to purchase (via Parentmail)until 1/2. After this date you will need to wait until September to be in with a chance of winning! The school is in the process of consulting parents and other stakeholders regarding potential changes to the current school uniform. A link to the survey has been issued to all parents via ParentMail. Please note that the deadline for responses is Friday 13 January. We often hear parents ask how they can support the school, especially in this difficult financial environment. SISA (the St Ivo School Association) is pleased to announce a new fundraising initiative to support the teaching and learning at St Ivo and at the same time, will give ‘pay back’ to those that buy into it in the form of a monthly prize draw. For the remaining academic year we are planning to run a ‘200 Club’ to provide funds to support teaching and learning in the school for specific projects. Examples of previous purchases are high quality cameras for photography and specialist drawing boards for A Level Design Technology. 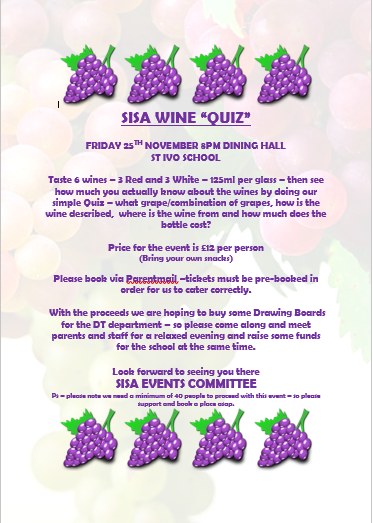 Thank you to all who came along to the SISA wine quiz on Friday night. £118 was raised and we are looking forward to ordering some Drawing Boards for the Design and Technology department. Whether you can spare an hour or all day, please join us on Sun 21 Aug and Sat 3 Sept from 10-4 - we’d love to see you! 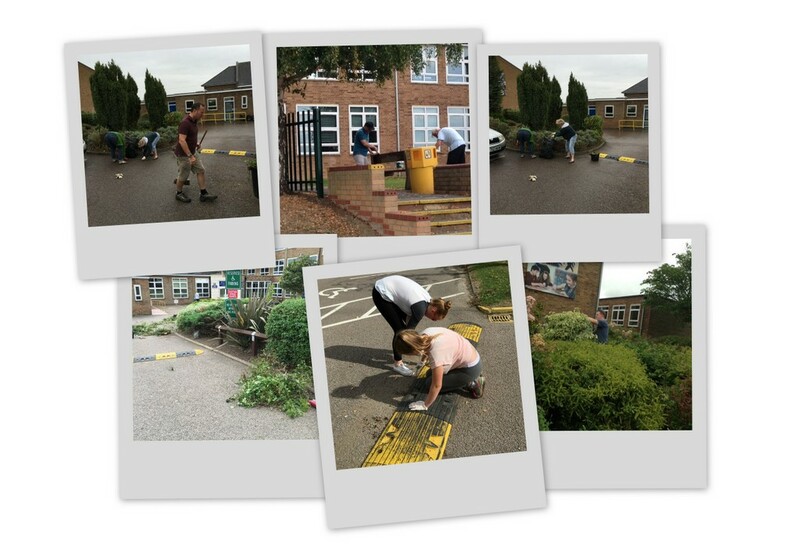 Thanks to lots of parents and teachers who volunteered to paint, stain, sweep and garden, the school looked even better than ever ahead of the new academic year last summer.